Hurricane Okhi struck on 29.11.2017. Our supplier partner New Ambadi in India lost ca. 12,000 rubber trees (out of a total of 180,000). This is problematic, as individual ‘bald’ patches on a plantation are impossible to fill in, i.e. it can take as long as 25 years before production losses can be addressed as part of the general replanting cycle. A similar number of trees was half uprooted by the cyclone – young plantings were particularly hard hit. The semi uprooted trees, old and young, are painstakingly pulled upright and tied down. One can only hope that no new hurricane will strike – because the ropes won’t be strong enough. More important (from a Fair Trade perspective) was the decision by the joint body (already taken prior to the hurricane) to spend 15% of the Fair Trade premiums on requests from the surrounding community. From day one after the hurricane struck (it lasted ‘only’ some 30 minutes) New Ambadi was able to provide new roofing sheets to some 100 families in the neighbourhood who had lost the roofs over their heads. On average five sheets at a cost of Rs. 500 per sheet (ca. 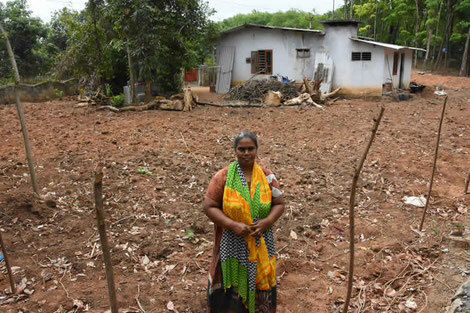 EUR 35/home) were provided – which earned New Ambadi a lot of good will and admiration for providing help so speedily. E.g. from Darma Chitan, who lives ca. 30 meters from the border of the estate.